How Can You Not Love That Whiskered Face? - What? Why? How Come? November is Manatee Awareness Month. I first discovered the gentle manatee many summers ago at SeaWorld, while on a family vacation to Florida. I found these huge creatures captivating and stayed at the tank watching them much longer than my family would have liked. Known for their gentle, slow nature, they are sometimes playful, and enjoy rolling or body surfing in the wild. They eat and rest often and seem to be perpetually smiling. There are three species of manatees in the world: the West Indian, the Amazonian, and the West African. 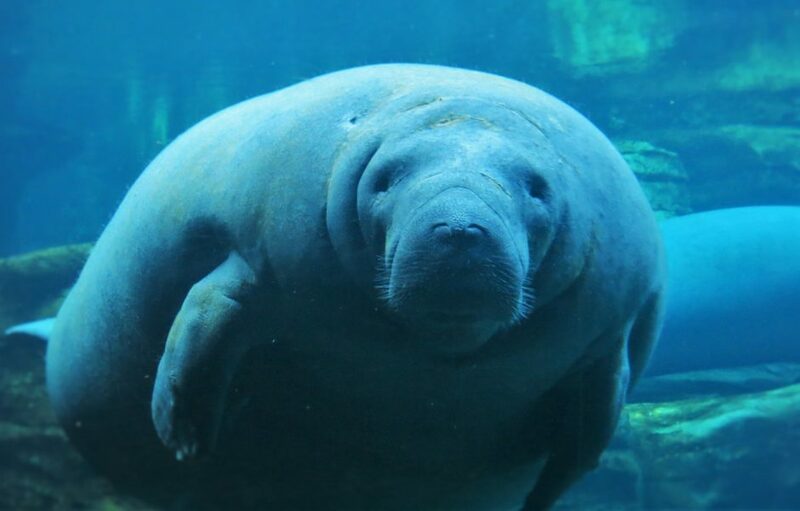 West Indian manatees are broken down into two species: the Florida manatee and the Caribbean manatee. Another species, the Steller’s sea cow, became extinct in 1768 due to overzealous hunting practices in the Arctic in the mid-1700s. Today’s adults manatees are about 10 feet long and generally weigh between 800 to 1200 pounds. Some have been recorded larger, up to 13 feet and 3500 pounds. The largest aquatic relative of the elephant, the manatee’s size hinders rather than helping them. They do not move as fast as other marine mammals and are easily hurt or even killed during encounters with speedboats. For this reason, you will see “No Wake” signs posted in areas that manatees are known to frequent. Their lack of speed may also contribute to the fact that many play host to algae. While it is not an appealing thought to us, this slimy stuff actually may be a benefit in shallow waters (where manatees most often are found) as it is though that it might act as a sunscreen. Herbivores, they eat seagrass and other plant life in shallow waterways along the Florida coast. During the warm summer months, some travel west to Louisiana or north to the Carolinas, or even as far as Cape Cod, MA. They spend much time underwater eating and breathe only through their nostrils. With lungs 2/3 the size of their body, they can stay underwater for 20 minutes. 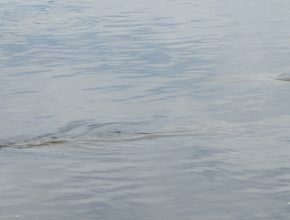 Evidence of manatees to look for are ripples or a snout poking out of the water. It is telling that though manatees have no natural predators in the wild, until earlier this year, they were on the endangered list (they were downgraded to threatened after a third consecutive year found at least 6000 in Florida). In recent years, cold weather, toxic algal blooms, reduction of habitat and collisions with watercraft have killed a couple hundred each year. Before government protections were enacted, manatees were hunted for their meat, blubber, bones and hide. Though they have a life expectancy of 60 years, the abovementioned threats mean many don’t live past 30 years in the wild. Manatees have one calf at a time (roughly every two to five years), with gestation lasting for 13 months. Calves are born underwater with birth stats averaging about 60 to 70 pounds and 3 to 4 feet long. They nurse underwater and stick close to mom for the first year or two of life. They communicate with each other through squeaks and chirps. Researchers believe their communication is for social reasons rather than navigational. They swim at a rate of about 3 to 5 miles per hour, but are capable of 20 miles per hour bursts. Manatees have been protected by the Marine Mammal Protection Act of 1972 and the Florida Manatee Sanctuary Act of 1978. The state of Florida has also worked to reduce manatee-boat collisions and to engage in manatee research, management plans, manatee education and awareness programs and habitat preservation. The state of Florida has established a number of safe havens for manatees, with the best known being Crystal River National Wildlife Refuge. 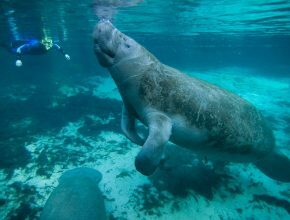 Others include Blue Spring State Park, Tampa Electric’s Manatee Viewing Center, and Fort Meyers’ Manatee Park. Crystal River National Wildlife Refuge was created in 1983 for the express purpose of protecting manatees. In 2012, the Fish and Wildlife Service added another protected area, the Kings Bay Manatee Refuge. 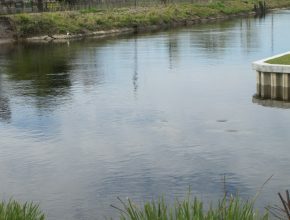 In these protected areas, slow speed zones have been established as well as regulations preventing manatee harassment. The manatee population increases from about 30 in the summer to 600 in the winter. Permitted activities include boating, snorkeling, scuba diving (summer only), and wildlife viewing from approved locations (including the Three Sisters Spring boardwalk, via a non-motorized vessel or through a snorkeling tour operator). Like most other national parks, there is also a visitor’s center with interpretative displays and ranger-run educational programs. If you plan to visit, make sure you first check out “Manatee Manners.” Violating these laws can result in a fine of up to $100,000 or one year in jail. Fishing is prohibited as are activities that can be seen as harassing the manatees. These include SCUBA diving in the winter months, separating a mother and calf, and chasing, cornering, any manatee or touching a resting, nursing or feeding manatees (it is a sad reflection that it is required to point out that poking/prodding/stabbing, riding/holding, grabbing/pinching, and standing on a manatee also need to be pointed out as prohibited). Burgs, Villes and Boros, What’s In a Name?